Well, I ran out of database room on my hosting account yesterday so the only thing to do was to move back to a blogging package that is not database backed. I thought about going back to dasBlog but instead decided to try out BlogEngine.NET. It's a new blog engine written in .NET and open source. It seems to have quite a bit of traction and has some nice features. After a few minor skirmishes I got my blog exported out of Subtext in a BlogML format and it imported into BlogEngine very easily. The only issue right now is existing URLs that are out there and waiting for Google to re-index the site. Anyway, so far I like it. Let me know what you think! I ran Windows Server 2003 as my desktop from the time it came out until Vista shipped and now I'm on Windows Server 2008. And boy does it rock! I won't repeat the many blog posts that are out there that go over the steps needed to get Win2k8 running just like Vista (though I will refer you to my last blog post about getting sidebar working right). What I will tell you is that almost everything runs under Win2k8 with less RAM than under Vista. People will tell you all day that there is no difference between the Vista SP1 and Win2k8 binaries but there is a difference somewhere. Actually I checked the ntoskrnl.exe binary from both Vista SP1 and Win2k8 and they are truly exactly the same. However, that doesn't mean they run the same. The Vista kernel could have all sorts of compatibility shims that get loaded dynamically or checked at runtime. One piece of evidence that Win2k8 is different is the fact that a few programs don't function correctly. The latest version of skype and microTorrent do not function (you can use an older version of Skype though). Desktop Window Manager 40-50 meg 756k (yes, k!). Part of this is the fact that I have not yet been able to enalble taskbar video thumbnails. 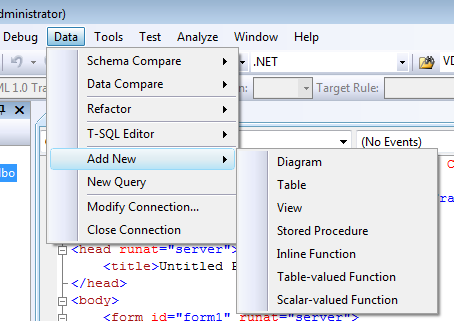 I've been working very hard on adding new features to our Visual Studio integration and one of those features is syntax highlighting of SQL when creating and editing stored procedures. With this new build we are using the core editor that is built inside Visual Studio. 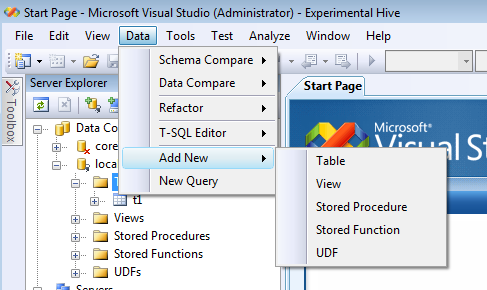 This brings other features such as the ability to split the code window. Currently I am hoping to have these new features in our 5.3 product.